Our versatile meeting and conference rooms can be suited to both small gatherings and large galas & has a modern audiovisual services. The business center and board rooms and conference hall with state-of-the-art equipment make it perfectly suited for corporate events, meetings, exhibitions, launching of products etc. Our well furnished conference hall is perfect location for all your business needs. The area is big enough to accommodate all your business clients and colleagues. 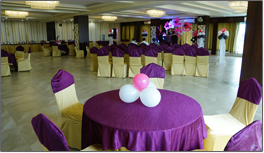 You can hold business meets, seminars or launches at our hotel. We understand your business needs and hence have incorporated basic conference needs like a PA(Public Address .) Systems and projector. Thus we ensure that all your business functions end smoothly without any hindrance.